In his latest creation, children’s author G. P. Taylor fuses mystery, adventure and a sense of the macabre, resulting in a vigorously animated story that will captivate its young readers, and no doubt have the same effect upon any unsuspecting adults that may peruse their bookshelves. 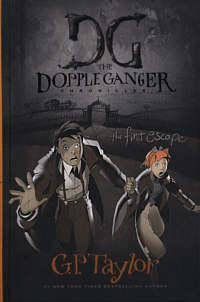 Book one of The Doppelganger Chronicles introduces us to troublesome twins Sadie and Saskia Dopple, who spend their days gleefully wreaking havoc at Isambard Dunstan’s School for Wayward Children, as evidently the best way to confront a world of iron clad rules and absent parents is with a riotous, egg-throwing attitude, and an equally fearless twin by your side. However, the combined existence of Sadie and Saskia is literally torn in two by the arrival of the mysterious Muzz Elliot, who adopts Saskia from the school and whisks her away to her unwelcoming mansion in a luxury Jaguar driven by handyman and butler Brummagem, who displays psychotic tendencies from the start. Desperate to find her sister, Sadie makes a daring escape from the school, accompanied by fellow abandoned child Erik Ganger, whose skills as a former accomplice to his father’s robberies prove useful along the way. While Saskia attempts to disentangle herself from the trappings of a sinister mystery that she discovers in her new home, the runaways also find themselves in danger, as they are pursued by an assortment of deliciously wicked characters, including a teacher who is, by definition, “a monster”, a washed up magician with a murderous streak, and a bloodhound out for flesh. Hailed “The new C.S. Lewis”, it is easy to see from this gem of a story why Taylor, author of 2004 bestseller Shadowmancer, is considered a modern master of children’s fiction. It may not be Narnia, but his depictions of brooding mansions, determinedly abusive villains and the odd instrument of torture are irresistibly vivid, complemented by sharply inventive illustrations that often take the form of comic strips, courtesy of artists Daniel Boultwood, Joseph Sapulich and Tony Lee. So much is packed into the book’s 278 pages, from a fake séance to a treasure hunt, a murder plot to the crashing of a police van into a lake, yet the result is a fast-paced, unrelenting story that manages to maintain its energy and charm, and only feels too rushed at a couple of points. The quiet hostility of Hampstead Heath at night, edged with danger, is an atmosphere skilfully constructed, while some genuinely frightening moments will alarm the most gutsy of readers. However, a quirky sense of humour is present throughout, combined with the reckless abandonment of the protagonists, who evidently prove themselves too cool for school. One of the downsides of including so many goings-on in this story is that readers may find it difficult to distinguish what the main message is supposed to be, particularly towards the end, where some unanswered questions are thrown up. However, the conclusion of Book one does prove to be engaging as it extends the mystery further, while a touching display of kinship sees the twins reunited. Therefore, reading the second instalment will prove to be absolutely necessary in order to satisfy burgeoning curiosity. With the Doppelganger Chronicles, G. P. Taylor has delivered a truly compelling piece of fiction which will delight children with the sheer adventure it offers, and ultimately hook in anyone that peers between its covers. This is a riot of a book that thankfully refuses to behave.